Music keeps coming back to you.. always. 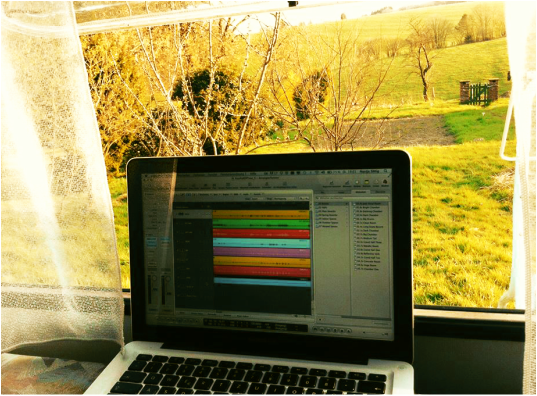 And new recordings come with the spring! In the last year: lots of work and studies for Nastja. the latter one soon will be over! So you'll be hearing more of us soon.. Und neue Aufnahmen kommen mit dem Frühling! Im letzten Jahr: viel Arbeiten und Studium bei Nastja. Letzteres ist bald endlich zu Ende! Also hört ihr demnächst wieder mehr von uns..
Leben, Lieben & Leiden - aber unzerstörbar bleibt die Schönheit. Sie rettet die Welt, sie macht Tränen zu salzigem Wasser, zum Wasser des Lebens. Wer weint, ist lebendig, er fühlt noch, trotz all dem. Wer noch weinen kann, der ist Zynismus und Bitterkeit, diesen unheilsamsten Lebenshaltungen, entgangen. Die Musik von LJON kommt aus irgend einer Gegend, in der man schon einmal gewesen sein muss, es ist länger her. Eine ferne Reise, eine Erinnerung an eine Zeit in der man oft traurig, aber dafür auch ganz ungebremst glücklich gewesen sein muss. Erschöpft nach einer langen Wanderung fiel man damals auf den warmen Sandboden eines einsamen Campingplatzes in Südfrankreich, auf der Suche nach sich selbst und trank Landwein ohne Etikett aus der Region - und da saß Nastja Sittig mit einer Gitarre und hat ihre Lieder gesungen. Ich glaube, man kann das nie wieder vergessen und beim hören ihrer Musik entsteht, ja erfindet sich musikalisch eine reinere Vergangenheit, in der man das einmal erleben durfte. Das macht nicht traurig, diese traurigen Lieder machen daher glücklich. Sie entstehen aus einer tiefen Ruhe, die tragische Texte, aber eben auch große Klarheit und Einfachheit kennen. Es lohnt sich, zu leben, nothing is in vain. 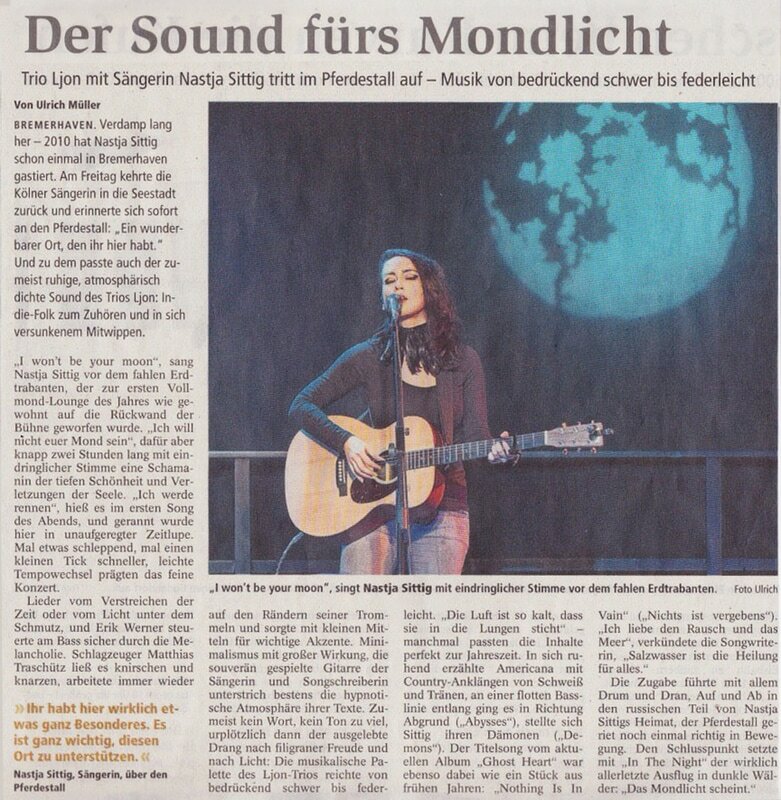 Beitrag von Songs & Stories. O Anagrama: What's your real name? Nastja: My name is Nastja. Erik is the bass player of Ljon and Matthes is our drummer. I’m composing and singing our songs. O Anagrama: Does the name Ljon have any special meaning to you? Why did you choose it? O Anagrama: Where are you from? Nastja: All three of us live in Cologne (Germany). I grew up in Berlin. O Anagrama: How old is Ljon? Nastja: Ljon is pretty young.. Our real birthday would be the release of our EP: december 2013. that’s also when we started truely performing as „Ljon“. O Anagrama: When did you start making music? Nastja: Since I was very little. I started singing before I could speak .. at least my mother says so. O Anagrama: What would you say are your greatest influences? Nastja: To speak for myself: One of my greatest influences are Prokofiev, russian and east german children’s songs, The Doors, Björk and Bob Dylan. There’s a lot more! But that would go beyond the scope. O Anagrama: What's your story with music? Why and how did you start playing, singing and composing? Nastja: Well, as I said, I started singing pretty early. Compared to speaking it just came naturally I guess. Until today it remained the easiest way to fully express myself. After a very close person in my life died I started composing. I had to cope with pain and despair. So it just came out in music. Until today I need to write songs to grasp the beauty and pain of life. O Anagrama: Where does the inspiration for your melodies and lyrics come from? Tell us about your creative process. Nastja: There’s multiple inspirations for the melodies and lyrics I write. As I said: they come from worlds in between. Most of the time I can’t remember how a song came to life. Of course my russian upbringing had a strong influence on the harmonies and melodies I use. But I’ve never written a song thinking: the melody has to sound like this or that. There has to be a flow and a pureness in the moment of creativity. It’s about letting go, letting the spirit fly.. I have to admit that the lyrics of Ljons album „Salty Water“ where partly inspired by a person that kept living as a ghost in my memories, enchanting and haunting me. But in the end it’s a unison of persons, moments and impressions that took a strong influence on the way I am now. I used to write in german for quite a while. But I actually started composing in english when I was a teen. So I somehow got back to the roots. Since english is not my native tongue it gives me a certain space, distance and simplicity. The majority of lyrics that I got influenced by are english. Still this language is like an unknown landscape to me. And I love to explore with it my feelings. As a band we share a very intimate creative process. Both, Erik and Matthes, are incredibly sensitive musicians, each with a very unique and different musical background. When we start playing and evolving our songs it’s like diving into each others souls. I’m very happy to have them as friends and music-colleagues. O Anagrama: What's your opinion on contemporary music and the music industry? Are there artists nowadays that you really admire? How do you think your music could fit in this context? Nastja: That is a really tricky question. I could write an essay about that. But to put it short: I think there is no black and white. There are certainly great artists in mainstream music nowadays. But most of the musicians I admire are those who are independent from a certain industry. The nature of music is free and independend to me. There are only a few artists who can stay true to themselves in the mainstream industry, I think. And they have very strong personalities. But generally: art doesn’t have to happen in the „big“ dimensions. It happens each moment.. in our kitchen or living-room.. in the universe of everyday life. I decided some time ago to keep my creativity as „independend“ as possible. On the whole I think Ljon is there – the way as it is. It’ll keep breathing and growing without any pressure. We’re not striving to become anything other than we are right now. We’re just being who we are, loving what we are doing and sharing it with others. I for one love to have close contact to the people that listen to our music and connect with them. That’s a very valuable gift. O Anagrama: Why did you decide to start posting your songs on Youtube? When and how did you feel they were ready to be listened by other people? Nastja: I had to share my feelings. Just as simple as that. I made myself very vulnerable and was also scared to put myself out there. I did not want to make stylish or artistic videos. I simply wanted to capture my feelings in a raw and simple way. Youtube served as a medium for that. I started doing that before „Ljon“ existed as a band. Some people may like the videos and some people don’t. I think the world got too obsessed with „liking“ and ranking things in general. The value of something lies in itself. When you’re accepting your flaws as perfection and your weaknesses as strength – no matter what other people think – then something can probably be considered as „ready“. O Anagrama: What are your goals? What do you see a few years from now for your career?